Sign up if you would like to assist Groundswell Community Project on International Surfing Day. Groundswell Community Project allows women to embrace healing and empowerment through bold and beautiful engagement with each other, the outdoors, and the arts. 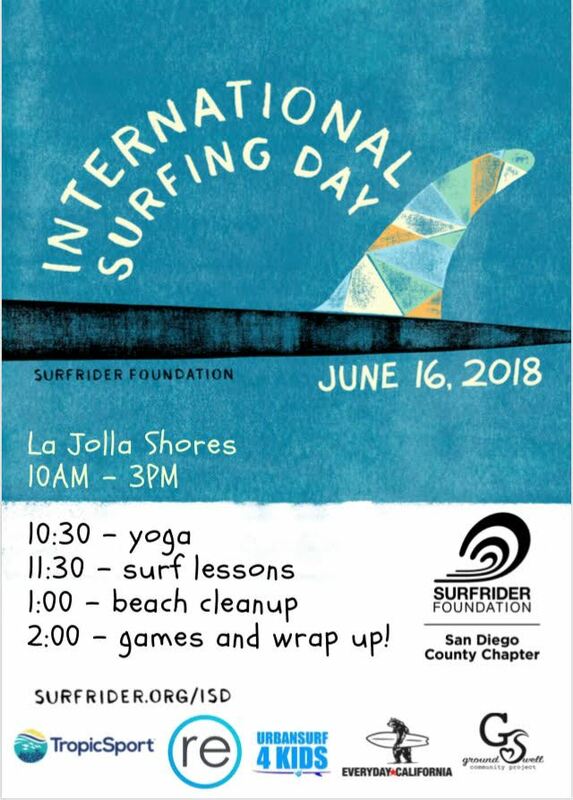 Come join them from 10AM to 3PM at La Jolla Shores for yoga, surf lessons, beach clean up and games. Volunteers are needed to assist so contact Natalie Small of Groundswell Community Project directly at natalie@groundswellcommunity.org or register online here. Be sure to swing by the Surfers Unite Rotarian Fellowship tent at the 14th Annual Switchfoot BroAM on June 30th to get in the barrel with Natalie and other SURF members as well as to learn about all of the activities we have planned throughout the world. Connecting generations and serving those in need that's just a part of what we do with Surfers Unite. Volunteers are needed for this event sponsored by the Surfrider Foundation.